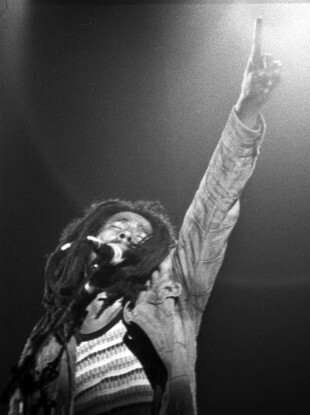 Bob Marley’s 1980 concert at Dalymount Park shook up a conservative Ireland. Denis Buckley remembers his schoolboy trip to the gig, just months before Marley’s death. With Marley – the documentary about the life of iconic reggae musician Bob Marley – now showing in cinemas, Denis Buckley remembers the day the great man came to a grey, conservative Ireland. JULY 6, 1980 WON’T figure in many future history books on momentous occasions in Irish life. This doesn’t mean however that the course of the country’s destiny was unaffected by this date – just that those, like me, who remember what happened that day, perceived that change had to come. Ireland in the early 1980s, particularly the West, was a deeply conservative place. A right-wing pontiff still had the fumes from his transport permeating the air. The economy was third world and anyone in authority of any kind all had the same single bad suit. Into that dull oppression came sound. Sound, alien to the bad suits and the bad hair. Violent crashing angry sound that I comprehended on first hearing as if I had not known I’d thirsted until I drank. The bravery of posture was inspirational. To rail against the prospect of a life in Ford Dagenham wasn’t as daunting as the rejection of Vatican law, but it was an example. Punk led me to reggae. I got some records and listened over and over again. I played one side during the minutes after my lunch and before the hated walk back to school. Sourcing the music was difficult (my brother brought a Peter Tosh album back from Greece). Bob Marley’s music was most readily available, due to his deal with Island. The albums he made during the latter part of the 70’s I played endlessly. Hot days, windows drawn I came to memorise the lines in the way one did then due to repeated listening. Curiously the physical act of turning over an LP meant you listened again and again to the same record, an act perhaps lost to digital recording. I first got wind of a possible Marley concert some months before the date. The national press pondered pompously on whether he should be allowed to bring his weed into the country. It was tempered by the prevailing belief that despite the epidemic of alcohol abuse throughout the county allowing this “Rastafarian” to bring marijuana into Ireland would be the gates opening on something far more damaging than the public brawling and domestic violence visible on every street. I was then only 15, young enough still to collect all the cuttings from the papers and put them into a scrapbook. The racist interviews where Marley’s postcolonial Jamaican accent was scoffed at for its impenetrability: the probes into his relationships with the backing singers and of course his dope smoking. There was speculation that if his dope was impounded, Marley wouldn’t or maybe couldn’t arrive at all. He did and the concert was set for Sunday July 6 at Dalymount Park, the home of Bohemians football club on Dublin’s north side. I was going and looked around for some friends to join me. Two did and on the eve of the journey we entered our local pub where two octogenarians turned a (genuinely) blind eye to the scuffed school shoes queuing at the bar. We procured a bottle of whiskey for the train, and headed to Dublin. Walking to Dalymount we started to see more like us. The red, green and yellow started to predominate over the grey. Those that had long abandoned city life for rural communes were making their way through the dull estates where the yellow wellingtons of their long suffering children kicked immovable lampposts. It wasn’t quite an army, but we were united. Inside the dilapidated ground the facilities were woeful. Like the rusting dustbins, the basic amenities in 1970s Ireland were of the “if ain’t broke, it soon will be” variety. There was a general acceptance of this condition. I don’t remember much of the concert. Marley’s hair was much longer that I imagined. He threw it from one side to the other in that odd electrocuted dance he did. TV presenter Dave Heffernan was there, he was tall. The Three O’Clock Roadblock intro got a great cheer. I can’t remember the encore or even if we heard it. The last train was at 6.30 and we had to find the bottle. It wasn’t there. I was silently pleased, I think we all were, it was hard work for us. We made the train and I don’t think the three of us ever mentioned the day to each other since. Within five years of the concert, two of us who travelled that day were in England and the other a postman in Arhus. I was living in Kensal Rise where the dull bass of a dub note could be heard belting out from the boot of a tank-like Merc gasping to climb up Ladbroke Grove. During my first carnival I went to a shebeen with a women I just met. The sound was low enough to loosen the elastic on your socks. The woman departed sometime and I stayed on to hear the looping beats played on wardrobe-sized speakers. What was merely alternative to me was a military calling to young black Britons who had tired of the bullying police. With home grown reggae as their sound they fought back and the battle changed race relations in the UK. Ireland stuttered through the early eighties from the disastrous election promises of the previous decade. If anything, a more conservative tenure predominated following trends in Britain and the US. Ireland’s own brand was of a deeply offensive sort populated by those who believed their God effortlessly agreed with them on everything. They held sway and caused untold harm. There wasn’t an alternative consensus. The blame in retrospect is mine and those like me who saw the future as a liberal one – only then to buckle under the nasty zealots anger and feck off to complain about it elsewhere. We had the music, the youth and the attitude and we took it elsewhere. But, like Marley in his day, maybe our time has come. The way is now clear for self-definition. What sort of collective future do we want? To begin to define an ideal one must first imagine it, so lets not waste a good crisis. Denis Buckley is a filmmaker, writer and performance artist. He now lives in London. For more information, see denisbuckley.com. Email “Column: When Bob Marley came to Dublin, things changed for me”. Feedback on “Column: When Bob Marley came to Dublin, things changed for me”.